The best writer – whether a novelist or a short story writer – is the one who knows how to translate their happiness, frustration, anger and many other feelings into a written piece. And when that happens, we – the readers – at least for a moment, wish to know what exactly led to the creation of a certain novel, or a masterpiece. 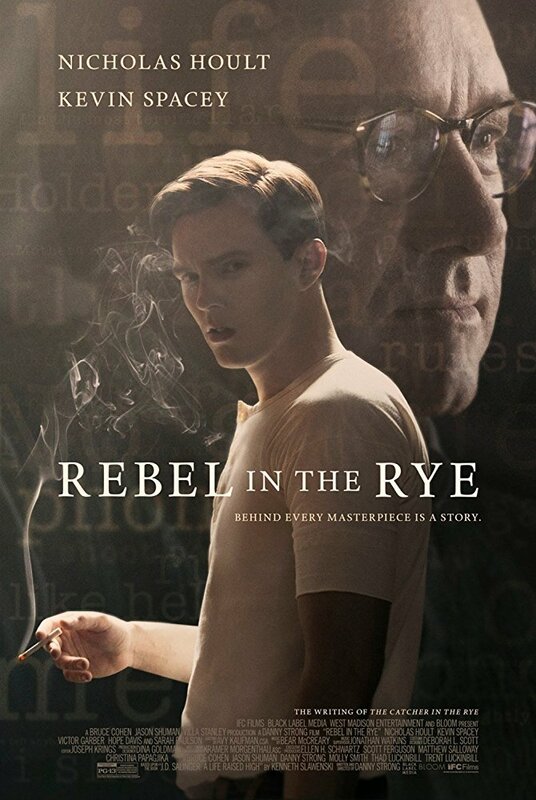 “Rebel in the Rye” is a biography film that has literally satisfied my curiosity, as I always wanted to know what made J. D. Salinger write one of the most important coming-of-the-age novels of the 20th century – “The Catcher in the Rye” – a book, that is in a way autobiography for Salinger himself. Set before the WWII, the film introduces young J.D. Salinger (portrayed by Nicholas Hoult), who is trying to find his own voice and whose attempts to publish his stories are rejected by the magazines as well as publishing companies. He finds a mentor – a teacher named Whit Burnett (Kevin Spacey). A person who knows how to handle Salinger’s energy and make him work harder. Burnett tells him: “The writer’s job is to continue writing even though there will be nothing to get in return.” And as it turns out, Salinger takes the advice seriously. Danny Strong’s “Rebel in the Rye” is the adaptation of the biography book “J.D. Salinger: A Life” by Kenneth Slawenski. As the story unfolds, the viewer gets a chance to learn more about Jerome David Salinger’s life – about him being an uncompromising writer and a person who would stick to his vision, develop a unique language, to help the readers connect with his stories. His brief relationship with Oona O’Neill (portrayed by Zoey Deutch) resulted in him writing a short story about a relationship that did end well. The story was published in The New Yorker magazine. Another amazing line, that the viewer will memorize from the film, is during the war. While developing his most prominent character – Holden Caulfield, Salinger says: “The best writer is the one who continues writing in his mind when in his hand, he holds a gun instead of a pen.” Just hearing those lines, helps us to better understand one the most popular and mysterious figures in American literary history. He was a person who did not write because somebody wanted him to, but because he had so much going on in his head that he felt confident to share with the readers. In conclusion, “Rebel in the Rye” is one of those movies, that is targeting a very specific audience who will understand Danny Strong’s main purpose. The movie, that claims to be one of the greatest biography pieces ever made, manages to touch upon Salinger’s pain, his frustration as well as why he wanted his protagonist of “The Catcher in the Rye” to be taken seriously, and not become just another character from a random novel. Because neither Caulfield was a random character, nor Salinger – a random writer. And I believe Strong’s film succeeds in capturing that and passing it to the viewer.